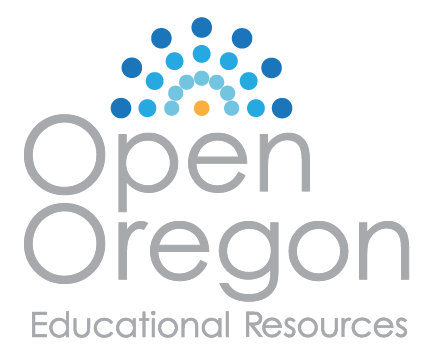 Information on the consumption choices of Americans is available from the Consumer Expenditure Survey carried out by the U.S. Bureau of Labor Statistics. Table 1 shows spending patterns for the average U.S. household. The first row shows income and, after taxes and personal savings are subtracted, it shows that, in 2015, the average U.S. household spent $48,109 on consumption. The table then breaks down consumption into various categories. The average U.S. household spent roughly one-third of its consumption on shelter and other housing expenses, another one-third on food and vehicle expenses, and the rest on a variety of items, as shown. Of course, these patterns will vary for specific households by differing levels of family income, by geography, and by preferences. To understand how a household will make its choices, economists look at what consumers can afford, as shown in a budget constraint line, and the total utility or satisfaction derived from those choices. In a budget constraint line, the quantity of one good is measured on the horizontal axis and the quantity of the other good is measured on the vertical axis. The budget constraint line shows the various combinations of two goods that are affordable given consumer income. Consider the situation of José, shown in Figure 1. José likes to collect T-shirts and watch movies. In Figure 1, the quantity of T-shirts is shown on the horizontal axis, while the quantity of movies is shown on the vertical axis. If José had unlimited income or goods were free, then he could consume without limit. But José, like all of us, faces a budget constraint. José has a total of $56 to spend. The price of T-shirts is $14 and the price of movies is $7. Notice that the vertical intercept of the budget constraint line is at eight movies and zero T-shirts ($56/$7=8). The horizontal intercept of the budget constraint is four, where José spends of all of his money on T-shirts and no movies ($56/14=4). The slope of the budget constraint line is rise/run or –8/4=–2. The specific choices along the budget constraint line show the combinations of T-shirts and movies that are affordable. Figure 1. A Choice between Consumption Goods. José has income of $56. Movies cost $7 and T-shirts cost $14. The points on the budget constraint line show the combinations of movies and T-shirts that are affordable. José wishes to choose the combination that will provide him with the greatest utility, which is the term economists use to describe a person’s level of satisfaction or happiness with his or her choices. Notice that marginal utility diminishes as additional units are consumed, which means that each subsequent unit of a good consumed provides less additional utility. For example, the first T-shirt José picks is his favorite and it gives him an addition of 22 utils. The fourth T-shirt is just to something to wear when all his other clothes are in the wash and yields only 18 additional utils. This is an example of the law of diminishing marginal utility, which holds that the additional utility decreases with each unit added. The rest of Table 2 shows the quantity of movies that José attends, and his total and marginal utility from seeing each movie. Total utility follows the expected pattern: it increases as the number of movies seen rises. Marginal utility also follows the expected pattern: each additional movie brings a smaller gain in utility than the previous one. The first movie José attends is the one he wanted to see the most, and thus provides him with the highest level of utility or satisfaction. The fifth movie he attends is just to kill time. Notice that total utility is also the sum of the marginal utilities. Read the next Work It Out feature for instructions on how to calculate total utility. Table 3 looks at each point on the budget constraint in Figure 1, and adds up José’s total utility for five possible combinations of T-shirts and movies. Let’s look at how José makes his decision in more detail. Step 1. Observe that, at point Q (for example), José consumes three T-shirts and two movies. Step 2. Look at Table 2. You can see from the fourth row/second column that three T-shirts are worth 63 utils. Similarly, the second row/fifth column shows that two movies are worth 31 utils. Step 3. From this information, you can calculate that point Q has a total utility of 94 (63 + 31). Step 4. You can repeat the same calculations for each point on Table 3, in which the total utility numbers are shown in the last column. For José, the highest total utility for all possible combinations of goods occurs at point S, with a total utility of 103 from consuming one T-shirt and six movies. Most people approach their utility-maximizing combination of choices in a step-by-step way. This step-by-step approach is based on looking at the tradeoffs, measured in terms of marginal utility, of consuming less of one good and more of another. For example, say that José starts off thinking about spending all his money on T-shirts and choosing point P, which corresponds to four T-shirts and no movies, as illustrated in Figure 1. José chooses this starting point randomly; he has to start somewhere. Then he considers giving up the last T-shirt, the one that provides him the least marginal utility, and using the money he saves to buy two movies instead. Table 4 tracks the step-by-step series of decisions José needs to make (Key: T-shirts are $14, movies are $7, and income is $56). The following Work It Out feature explains how marginal utility can effect decision making. Step 1. From Table 2, José can see that the marginal utility of the fourth T-shirt is 18. If José gives up the fourth T-shirt, then he loses 18 utils. Step 2. Giving up the fourth T-shirt, however, frees up $14 (the price of a T-shirt), allowing José to buy the first two movies (at $7 each). Step 3. José knows that the marginal utility of the first movie is 16 and the marginal utility of the second movie is 15. Thus, if José moves from point P to point Q, he gives up 18 utils (from the T-shirt), but gains 31 utils (from the movies). Step 4. Gaining 31 utils and losing 18 utils is a net gain of 13. This is just another way of saying that the total utility at Q (94 according to the last column in Table 3) is 13 more than the total utility at P (81). Step 5. So, for José, it makes sense to give up the fourth T-shirt in order to buy two movies. José clearly prefers point Q to point P. Now repeat this step-by-step process of decision making with marginal utilities. José thinks about giving up the third T-shirt and surrendering a marginal utility of 20, in exchange for purchasing two more movies that promise a combined marginal utility of 27. José prefers point R to point Q. What if José thinks about going beyond R to point S? Giving up the second T-shirt means a marginal utility loss of 21, and the marginal utility gain from the fifth and sixth movies would combine to make a marginal utility gain of 23, so José prefers point S to R.
However, if José seeks to go beyond point S to point T, he finds that the loss of marginal utility from giving up the first T-shirt is 22, while the marginal utility gain from the last two movies is only a total of 19. If José were to choose point T, his utility would fall to 100. Through these stages of thinking about marginal tradeoffs, José again concludes that S, with one T-shirt and six movies, is the choice that will provide him with the highest level of total utility. This step-by-step approach will reach the same conclusion regardless of José’s starting point. Another way to look at this is by focusing on satisfaction per dollar. Marginal utility per dollar is the amount of additional utility José receives given the price of the product. 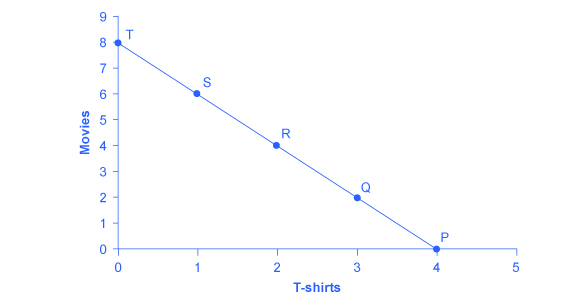 For José’s T-shirts and movies, the marginal utility per dollar is shown in Table 5. José’s first purchase will be a movie. Why? Because it gives him the highest marginal utility per dollar and it is affordable. José will continue to purchase the good which gives him the highest marginal utility per dollar until he exhausts the budget. José will keep purchasing movies because they give him a greater “bang or the buck” until the sixth movie is equivalent to a T-shirt purchase. José can afford to purchase that T-shirt. So José will choose to purchase six movies and one T-shirt. This process of decision making suggests a rule to follow when maximizing utility. Since the price of T-shirts is twice as high as the price of movies, to maximize utility the last T-shirt chosen needs to provide exactly twice the marginal utility (MU) of the last movie. If the last T-shirt provides less than twice the marginal utility of the last movie, then the T-shirt is providing less “bang for the buck” (i.e., marginal utility per dollar spent) than if the same money were spent on movies. If this is so, José should trade the T-shirt for more movies to increase his total utility. Marginal utility per dollar measures the additional utility that José will enjoy given what he has to pay for the good. Step 4. Choice 4 in Table 4 shows that if we move to point S, we would lose 21 utils from one less T-shirt, but gain 23 utils from two more movies, so we would end up with more total utility at point S.
Jeremy is deeply in love with Jasmine. Jasmine lives where cell phone coverage is poor, so he can either call her on the land-line phone for five cents per minute or he can drive to see her, at a round-trip cost of $2 in gasoline money. He has a total of $10 per week to spend on staying in touch. To make his preferred choice, Jeremy uses a handy utilimometer that measures his total utility from personal visits and from phone minutes. Using the values given in Table 6, figure out the points on Jeremy’s consumption choice budget constraint (it may be helpful to do a sketch) and identify his utility-maximizing point. Take Jeremy’s total utility information in Self-Check Question 1, and use the marginal utility approach to confirm the choice of phone minutes and round trips that maximize Jeremy’s utility. Who determines how much utility an individual will receive from consuming a good? Would you expect total utility to rise or fall with additional consumption of a good? Why? Would you expect marginal utility to rise or fall with additional consumption of a good? Why? Is it possible for total utility to increase while marginal utility diminishes? Explain. If people do not have a complete mental picture of total utility for every level of consumption, how can they find their utility-maximizing consumption choice? What is the rule relating the ratio of marginal utility to prices of two goods at the optimal choice? Explain why, if this rule does not hold, the choice cannot be utility-maximizing. Think back to a purchase that you made recently. How would you describe your thinking before you made that purchase? The rules of politics are not always the same as the rules of economics. In discussions of setting budgets for government agencies, there is a strategy called “closing the Washington monument.” When an agency faces the unwelcome prospect of a budget cut, it may decide to close a high-visibility attraction enjoyed by many people (like the Washington monument). Explain in terms of diminishing marginal utility why the Washington monument strategy is so misleading. Hint: If you are really trying to make the best of a budget cut, should you cut the items in your budget with the highest marginal utility or the lowest marginal utility? Does the Washington monument strategy cut the items with the highest marginal utility or the lowest marginal utility? Praxilla, who lived in ancient Greece, derives utility from reading poems and from eating cucumbers. Praxilla gets 30 units of marginal utility from her first poem, 27 units of marginal utility from her second poem, 24 units of marginal utility from her third poem, and so on, with marginal utility declining by three units for each additional poem. Praxilla gets six units of marginal utility for each of her first three cucumbers consumed, five units of marginal utility for each of her next three cucumbers consumed, four units of marginal utility for each of the following three cucumbers consumed, and so on, with marginal utility declining by one for every three cucumbers consumed. A poem costs three bronze coins but a cucumber costs only one bronze coin. Praxilla has 18 bronze coins. Sketch Praxilla’s budget set between poems and cucumbers, placing poems on the vertical axis and cucumbers on the horizontal axis. Start off with the choice of zero poems and 18 cucumbers, and calculate the changes in marginal utility of moving along the budget line to the next choice of one poem and 15 cucumbers. Using this step-by-step process based on marginal utility, create a table and identify Praxilla’s utility-maximizing choice. Compare the marginal utility of the two goods and the relative prices at the optimal choice to see if the expected relationship holds. Hint: Label the table columns: 1) Choice, 2) Marginal Gain from More Poems, 3) Marginal Loss from Fewer Cucumbers, 4) Overall Gain or Loss, 5) Is the previous choice optimal? Label the table rows: 1) 0 Poems and 18 Cucumbers, 2) 1 Poem and 15 Cucumbers, 3) 2 Poems and 12 Cucumbers, 4) 3 Poems and 9 Cucumbers, 5) 4 Poems and 6 Cucumbers, 6) 5 Poems and 3 Cucumbers, 7) 6 Poems and 0 Cucumbers. If we choose zero through five round trips (column 1), the table below shows how many phone minutes can be afforded with the budget (column 3). The total utility figures are given in the table below. Adding up total utility for round trips and phone minutes at different points on the budget line gives total utility at each point on the budget line. The highest possible utility is at the combination of one trip and 160 minutes of phone time, with a total utility of 1120. The first step is to use the total utility figures, shown in the table below, to calculate marginal utility, remembering that marginal utility is equal to the change in total utility divided by the change in trips or minutes. Note that we cannot directly compare marginal utilities, since the units are trips versus phone minutes. We need a common denominator for comparison, which is price. Dividing MU by the price, yields columns 4 and 8 in the table below. Start at the bottom of the table where the combination of round trips and phone minutes is (5, 0). This starting point is arbitrary, but the numbers in this example work best starting from the bottom. Suppose we consider moving to the next point up. At (4, 40), the marginal utility per dollar spent on a round trip is 25. The marginal utility per dollar spent on phone minutes is 190. Since 25 < 190, we are getting much more utility per dollar spent on phone minutes, so let’s choose more of those. At (3, 80), MU/PRT is 30 < 150 (the MU/PM), but notice that the difference is narrowing. We keep trading round trips for phone minutes until we get to (1, 160), which is the best we can do. The MU/P comparison is as close as it is going to get (40 vs. 70). Often in the real world, it is not possible to get MU/P exactly equal for both products, so you get as close as you can.